Allie Wass grew up Michigan, where she pursued her love of art and studied Illustration at Kendall College of Art & Design. Wass now lives and works in Seattle, Washington, transitioning from freshwater to the ocean. Wass gathers inspiration through experience, and she isn’t koi about puns either. “Some of my earliest memories are spending time on a lake or pond, fishing, throwing cast after cast hoping I would catch a fish. Time spent fishing is much more than a hobby to me, it’s how I learned patience. It is time and memories spent bonding with family, and it’s what brought me to fall in love with the sheer beauty of fish and gain a greater appreciation of the natural world around me from an early age. 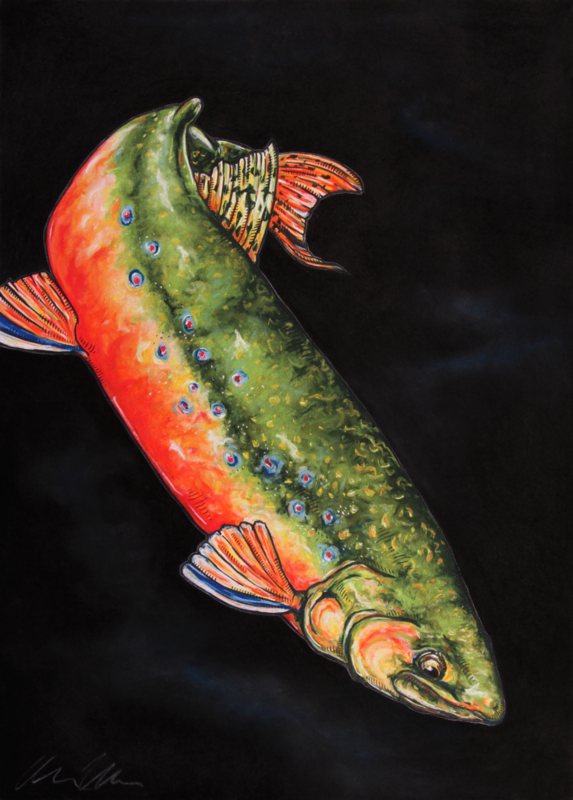 Fishing is intuitive, and I strive to reflect that same fluid nature in my art. I recently drifted to the Pacific Northwest looking for a bigger pond. The fish here are different than in the Midwest, and I see them differently. This is reflected in my recent work with the exploration of new species, a bolder approach to color, and cleaner, more defined lines that match the subtleties of each fish. Having left the place where I learned to fish, draw, and grow, I find myself to evolving with my surroundings.